The format of the open events may change from year to year to maintain interest, and in July 2015 for example, the Beckingham Open Pairs was held over a full day at the weekend when 28 pairs of players competed for a trophy and cash prizes. Food prepared by members and their partners is available all day in the Village Hall. 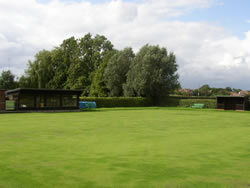 For details of the format of current events, please click on “Latest Bowls Club News” below. At the end of the season a Presentation Evening (including a meal) is arranged for members and their partners in the Willow Works. The A.G.M is usually held in January in the Recreation Room. The Club is open to everyone over the age of thirteen, and Club Nights are held during the season on Thursdays from 6pm, when anyone interested in playing and finding out more about full or just social membership is welcome to come along. Non members can play on the green at other times if accompanied by a paid up member. Woods are available and flat shoes are required on the green. Please telephone Roger Platts on 01427 848628 to find out more.